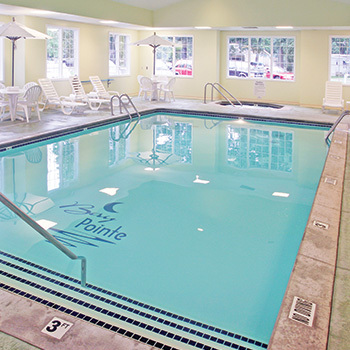 Welcome to Bay Pointe, "One of Michigan's Top Resorts"
Bay Pointe Inn is a New England style property on the south shore of Gun Lake, this award-winning resort is only 8 minutes from the Yankee Springs State Recreation Area. 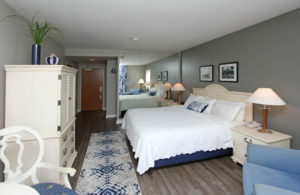 The bright, newly remodeled guestrooms and suites include free Wi-Fi and continental breakfast. 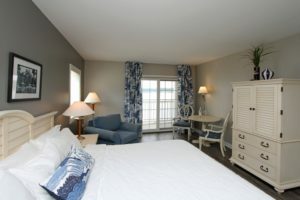 Most accommodations offer private balconies with lake or garden views. 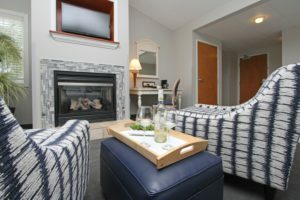 Suites include sitting areas with fireplaces, whirlpool tubs and kitchenettes with mini-fridges, coffee makers and microwaves. 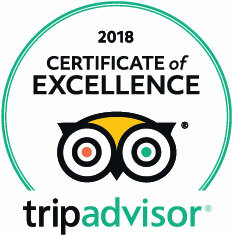 Complimentary breakfast is served daily in the Terrace Grille Restaurant, which has a lakeside veranda for dining or cocktails. There's an indoor pool, hot tub, fitness center. 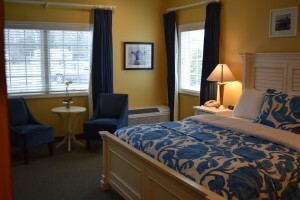 Don’t settle for a typical stay at a typical location, enjoy Bay Pointe Inn. 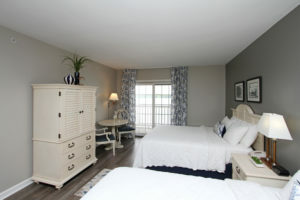 This charming room offers plenty of natural light overlooking the southside of the property. 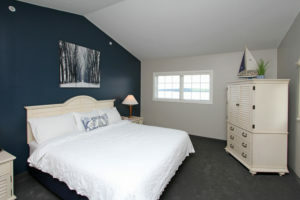 This guestroom is split into two rooms by a loft style 3/4 wall, one with a king bed, and the other with two queens. 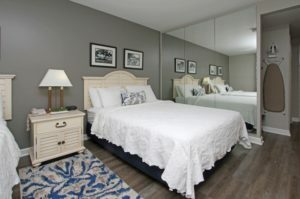 Boasting 2 flat screen LED televisions, a mini fridge, microwave, coffee maker, seating area and plenty of space this guestroom is the perfect room for you and your family. 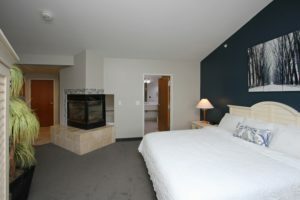 Close to the pool, hot tub and fitness area. 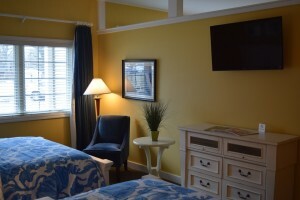 The largest and most beautiful suite offers 550 square feet of soothing decor. 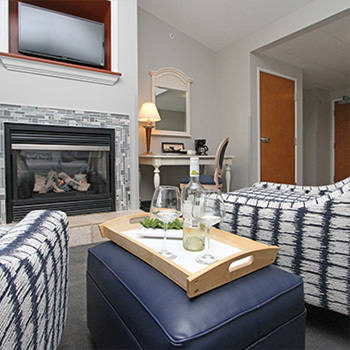 Ease your spirit while soaking in your whirlpool tub, placed next to the three sided glass fireplace. 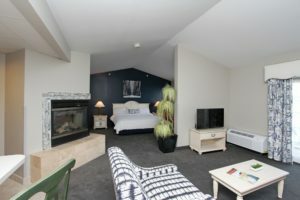 A private 3rd floor balcony, living area, sleeper sofa, kitchenette with coffee maker and mini fridge and 2 flat screen TV’s complete this room. 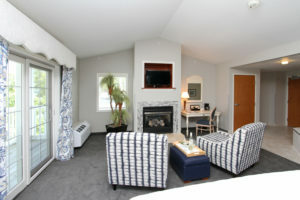 This beautifully adorned suite offers an ambiance unlike any other in Southwest Michigan. A private 3rd floor balcony is the perfect place to overlook the gardens and waterfall with a prime view of the lake. 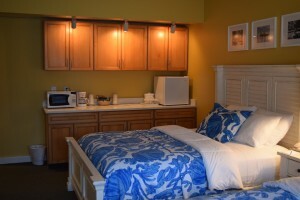 The room boasts an over sized whirlpool tub, kitchenette, coffee maker, mini fridge, a flat screen TV and has a king size pillow top bed. 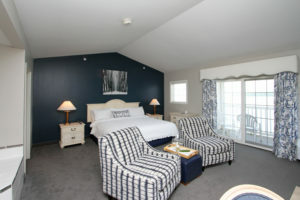 This second floor romantic room was designed for two. 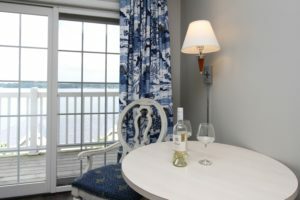 An extremely comfortable king bed will ensure a soothing nights sleep, and the private corner balcony allows for a view of beautiful sunrises over historic Gun Lake. This beautifully decorated room category is offered with one or two comfortable queen size beds, small sitting area and a flat screen TV. 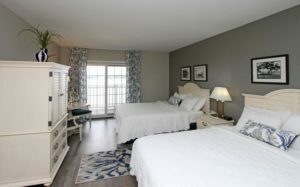 Have your morning coffee on your spacious private walk out patio or balcony which allows for beautiful views over mystical Gun Lake. 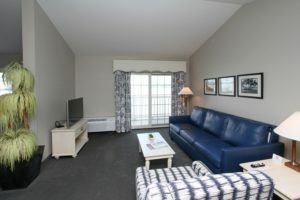 This charming room category offers a private balcony, overlooking the south side of the property. 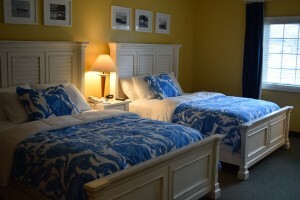 This guestroom has one or two comfortable queen size beds, flat screen TV and small sitting area.